Two men who gave £3,000 to the Brussels terror attacks suspect known as the "man in the hat" have been jailed. Mohammed Ali Ahmed and Zakaria Boufassil handed the money to bombing suspect Mohamed Abrini in a Birmingham park in July 2015. Ahmed was jailed for eight years after pleading guilty to engaging in conduct in preparation for acts of terrorism. Boufassil, 26, from Birmingham, was found guilty by a jury at Kingston Crown Court and received three years. Mohamed Abrini had been sent by a leading fighter from so-called Islamic State to the UK to pick up the cash. The money came from benefits being paid into a bank account belonging to Anouar Haddouchi, a Birmingham man who had previously left to fight in Syria. It is not clear how the cash was ultimately used. Abrini, 31, has been linked to the Brussels terror attack in March this year, which killed 32 people at an airport and metro station, Kingston Crown Court was told. He became known as the "man in the hat" after CCTV footage was released of him after the attack. Over the course of two days, Ahmed and Boufassil used a series of counter-surveillance tactics to ensure that Abrini was not being followed, before eventually meeting him in Birmingham's Small Heath Park. The court heard Ahmed had used a replacement debit card for the account to make 17 withdrawals between May and June 2015, before handing the £3,000 to Abrini. There was said to have been telephone contact between all three men and technical evidence showing their phones had been in close proximity, including in the park. During his trial, Boufassil admitted that he had met Abrini in the park - but denied it was connected to terrorism and its funding. He also claimed he had been approached by MI5 after he met the terror suspect before being "thrown to the wolves". His lawyer, Dorian Lovell-Pank QC, told the court Boufassil was allegedly contacted by the security service and given up to £3,000 in exchange for information. He used it to buy a return flight to see his girlfriend in Casablanca, Morocco, and purchased clothes and his favourite cigarettes. 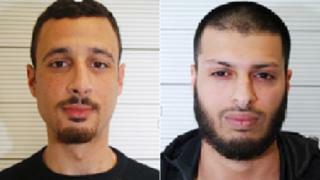 Boufassil was later arrested at Gatwick by counter-terrorism officers in April on his return to the UK. Mr Lovell-Pank told the court: "Zakaria Boufassil feels that he was effectively picked up by MI5 and 'pumped and dumped'. "He feels he may have ceased to be of any use to them and as a result was effectively thrown to the wolves, which is in fact what happened." Prosecutor Karen Robinson said she could neither "confirm nor deny" the MI5 claims and the judge ruled them inadmissible as evidence. He lifted an order banning reporting of the claims at the sentencing hearing. Sentencing Ahmed, Mr Justice Jeremy Baker told him: "I am sure that you are an individual who has for some time, and continues to hold extreme Islamist beliefs, and that you are committed to the cause of Islamic State." The judge said that Boufassil's motivations had been less clear. "There is no evidence, beyond your participation in the offence, that you hold extreme Islamist beliefs and have an ongoing commitment to the cause of Islamic State," he said. Justice Baker also imposed an additional one year licence on both men which will apply on their eventual release from prison. The Crown Prosecution Service said said the pair had been jailed for handing over money with the intention it would support international terrorism. Sue Hemming, head of the CPS special crime and counter terrorism division, said: "It is clear that you do not need to leave the country to be prosecuted for preparing terrorist acts or assisting others to do so. "Offences can be committed in your bank, your place of work, even in your own home."